Clarence T. Burke was the eldest son of Chief Porker Jim, the first Pendleton Round-Up Chief. Chief Burke was born at Cayuse and resided near there his entire life. Following his father's death in 1936, he became the co-chief with Willie Wocatsie in 1936 and served in that capacity for 51 years. Chief Burke was often cited as "the most photographed Indian in North America." A local tribal woman once said that the most important thing Burke taught her was to build no barriers between yourself and others. 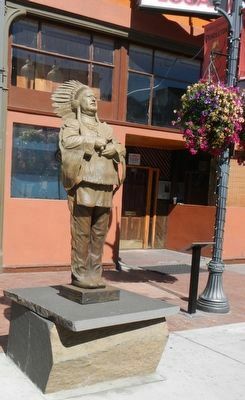 Whether serving as an ambassador of the Confederated Tribes of Umatilla, or a representative of the Pendleton Round-Up and Happy Canyon, the Pendleton Woolen Mills, or the City of Pendleton, he was a popular figure wherever he traveled. 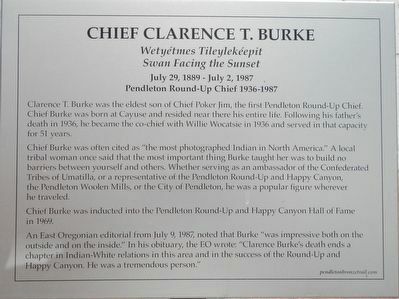 Chief Burke was inducted into the Pendleton Round-Up and Happy Canyon Hall of Fame in 1969. The marker is below the flower basket. relations in this area and in the success of the Round-Up and Happy Canyon. He was a tremendous person." Erected by Pendleton Bronze Trail. Location. 45° 40.387′ N, 118° 47.26′ W. Marker is in Pendleton, Oregon, in Umatilla County. Marker is on South Main Street near Southeast Byers Avenue. Touch for map. 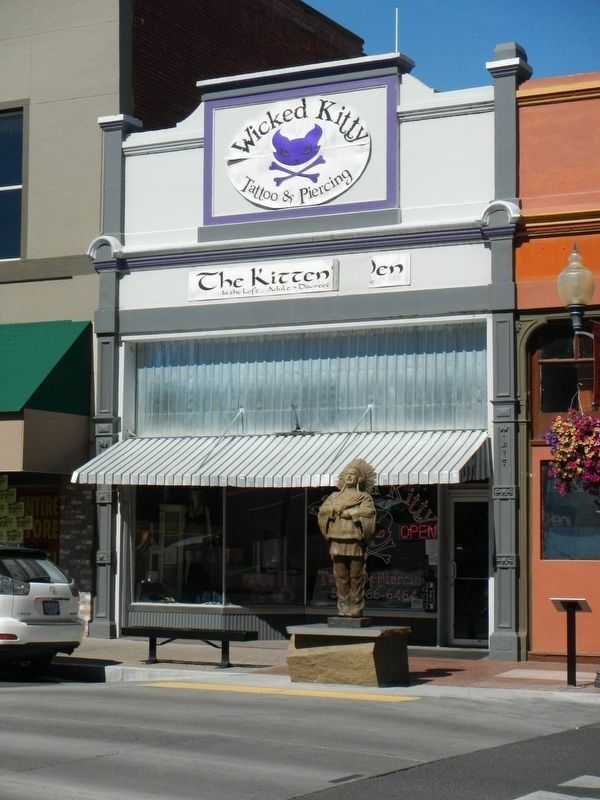 Marker is at or near this postal address: 132 South Main Street, Pendleton OR 97801, United States of America. Touch for directions. Other nearby markers. At least 8 other markers are within walking distance of this marker. Club Cigar Saloon (here, next to this marker); Jackson Sundown (a few steps from this marker); Judd Block (within shouting distance of this marker); DeSpain Block (within shouting distance of this marker); The Peoples Warehouse (within shouting distance of this marker); State Saloon (within shouting distance of this marker); Donald C. Requa (within shouting distance of this marker); R.F. Renn Building (about 300 feet away, measured in a direct line). Touch for a list and map of all markers in Pendleton. More. Search the internet for Chief Clarence T. Burke. Credits. This page was last revised on December 23, 2017. This page originally submitted on December 23, 2017, by Barry Swackhamer of San Jose, California. This page has been viewed 89 times since then and 5 times this year. Photos: 1, 2, 3. submitted on December 23, 2017, by Barry Swackhamer of San Jose, California.